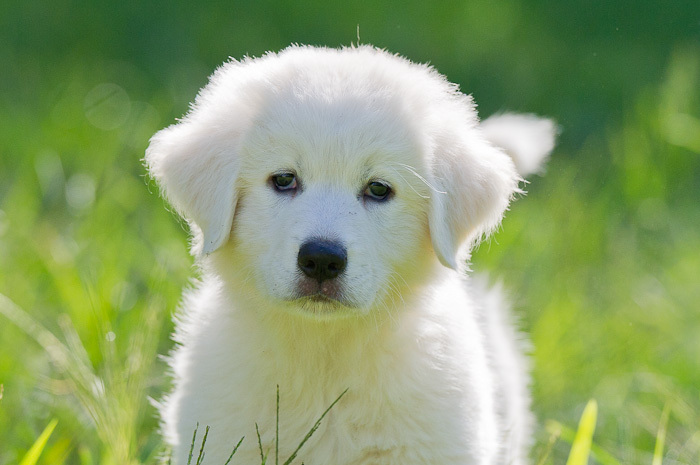 The Maremma Sheepdog puppies didn’t seem at all fazed by the 5.8 magnitude earthquake that struck just before our photo shoot this afternoon in Virginia. Both 8-week-old puppies—Jackson and Emma—were just emerging from an afternoon nap when I arrived. We spent some time in the house before moving out into the yard, where they quickly woke up and explored their surroundings. The late afternoon sun gleamed on their puffy white coats, creating some exposure challenges. But they were so accommodating that I caught a lot of fun shots, including this one of Jackson, who is the bravest of the two. I kept thinking that he must have been reincarnated, because he was the perfect model and posed for me as if he’d been in front of the camera all of his life. His “old soul” eyes spoke volumes even though his gangly limbs and gait revealed his youth. Jackson is gorgeous. Thanx for showing him. You’re welcome! He was a wonderful model, that’s for sure. Yes, he is way too cute! I love all puppies, but he was an exceptional one. So sweet… I want to hug him! He was so lovable, too. It was interesting to learn that they generally prefer to live outside with the animals they guard, because the puppies were so friendly and engaging. He is so cute! And it is so fun–and accurate–that personality comes through even when the puppy is so young. I’m glad I was able to get a few photo that showed his expression. He really looks like he knows and understands more than he should. A very interesting breed.